I read this book in a bookstore yesterday, never intending to read it, but my son's girlfriend picked it up and started reading it out loud. Before I knew it, we were both reading it out loud and laughing. In fact, we laughed at every page, at the witty wording, at the concept of the pole searching for its purpose, at the just plain fun silliness, and at the well done illustrations. It was in short, and it is a very short book, a delightful surprise shared with one of my favorite people in one of my favorite places. No one was more shocked than I that I loved this crazy little book. Of course, I'm a sucker for the playfulness of language, which this book has in spades. 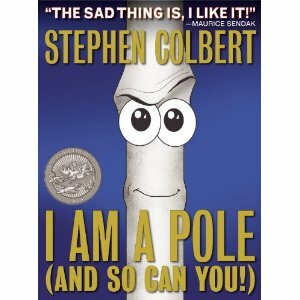 Again, I never expected to like such a book by Colbert, but I must give credit where credit is due, and Colbert is due much credit for providing a welcome relief to the seriousness of life and the world. As Maurice Sendak's blurb states at the top of the book, "The sad thing is, I like it!" No, I didn't buy the book, but I know that I will end up doing so. Serendipity defined! It really is a fun read, Joy!